Brandnames are the names that describe and stand for a brand. Of course, you all know that a brand is a promise. Or more specifically, a brand is a promise of an experience. Your goods or services will become known as brand name goods when customers have enjoyed the experience and the marketplace will anoint you via recognition. Engineers make devices. Marketeers make products. But brands are made in the mind of the consumer. The brand name is simply the shorthand used to describe this perception. Once earned it is very valuable, and you don’t want anyone watering it down with other naming confusion, so make sure your brand names, and would-be brand names, are all registered trademarks. Brand names can be bought and sold, and in fact, a company’s brand equity is often worth a lot of money. Want to run your own naming project? 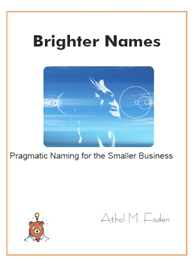 Learn the professional methodology by reading your own copy of Brighter Names: Pragmatic Naming fror the Smaller Business at Foden Press. Have you seen a customer back away at the very last minute? Do you know why that happens? Psychological Tactics help you overcome that frustration by looking inside the brain of your customer Go to www.psychotactics.com today! You won’t be disappointed.